During the twentieth century, a range of Americans engaged with the Chinese parlor game mahjong* not only as an entertaining consumer good but especially as a way to build community. In the process they helped redefine the meaning of race, gender, and material culture in modern America. Mahjong’s American story begins in 1922, when newspapers on the West Coast started buzzing about the “new-old” Chinese game. Advertisers promised that it would provide players an experience of ancient Eastern mystery, modern cosmopolitanism, and Jazz Age glamor. Almost overnight the buzz turned into a roar. Thanks to promoters and distributers like Abercrombie and Fitch, this parlor game played with bone-and-bamboo tiles instead of cards exploded into a national – and soon an international – fad. The mahjong mania created a cultural conversation to which Chinese Americans responded. Chinese Americans capitalized on an opportunity to market their “authenticity” while using the same game to build a sense of Chinese American unity. Within Chinatowns mahjong also had a presence of its own that did not engage white Americans. Although forgotten today, the craze defined the era for decades afterward. Drawing from diverse archival sources, photographs, advertising, personal papers, popular media, and original oral histories, my research provides the first scholarly examination of mahjong and its broader cultural significance in America. This study unfolds in three parts. It begins with the origins and production of the game in the cosmopolitan world of Shanghai at the turn of the century. 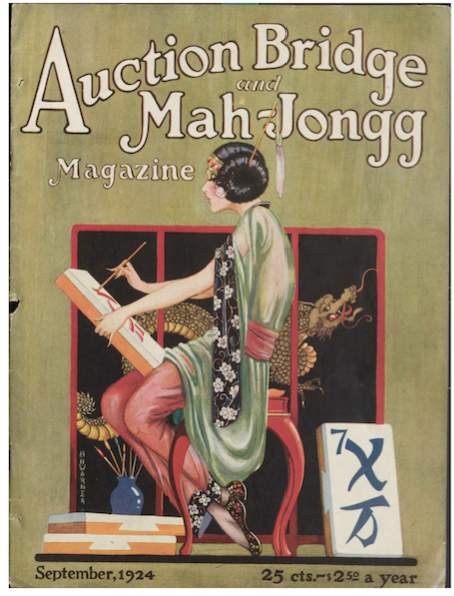 It then crosses the Pacific to examine the economics and cultural dynamics of the massive mahjong vogue in the early 1920s, when American consumers capitalized on the game to experiment with new boundaries of gender, race, and what it meant to be modern. Subsequent chapters explore how marginalized ethnic groups, particularly Chinese Americans and Jewish Americans, developed unique game cultures that helped navigate their place in American society and changing gender norms from the 1920s through the 1960s. An epilogue follows the recent history of the game from its continued diversification in the late twentieth century to today’s growing mahjong revival. If you have personal experiences with mahjong that you'd like to share, please contact me at mahjonghistory@gmail.com. In 2018, the University of Oregon Humanities Center interviewed me about my book project, Mahjong: A Chinese Game and the Making of Modern American Culture. During the 30-minute interview I discuss my thoughts on history and summarize some of the key portions of mahjong's history from Shanghai to the United States. My article in Frontiers examines the enormous cultural output inspired by the mahjong craze. Americans did not just play mahjong; they built an entire performative culture around it, from galas to garden plays. As the game quickly became feminized, society pages featured mahjong matrons dressed in Chinese costume. While white women used mahjong as a tool to experiment with new boundaries of respectable femininity, Chinese Americans leveraged mahjong’s popularity for economic opportunities in a discriminatory economy. As the game spread across the nation, mahjong also unleashed criticisms of Chinese influence and women’s leisure that linked female mahjong players with neglectful and self-centered domesticity. The ways in which mahjong symbolized modern American culture, buttressed by Orientalist ideas of race and gender, allowed the game to stand in for debates over white femininity. Rather than merely a temporary foray into the exotic, mahjong came to represent the threats posed by changing gender, sexual, and racial encounters during the 1920s. I wrote a reflective piece about my oral history research, published in October 2012 by the online resource Dissertation Reviews in their "Talking Shop" column. Dissertation Reviews is a wonderful interdisciplinary resource for circulating cutting-edge research via reviews of recently defended dissertations. The Humanities at Stanford division of the Stanford News Service wrote an article about my project. It encapsulates some of my main arguments and adventures in field research. In 2013, I was honored to be the featured guest on "The Better Part," a Bay Area community television program, with host Grace Trafton. During our interview I summarize mahjong's trajectory from Shanghai to the United States, from the 1920s to the 1960s. Haaretz: "A Mahjong renaissance among Jewish American women"
A great news piece in the New York Israeli sister publication of The Daily Forward. The reporter interviewed a number of sources regarding the history of Jewish American women and mahjong, including yours truly. Do you have mahjong memories to share? I am always interested in hearing what people remember about mahjong, especially memories that date before 1970. I would greatly appreciate any personal photographs or other mahjong memorabilia. Thank you for sharing your story and for helping make history! Please note that, unless otherwise specified, any communication may be quoted in my future writing and publication.